Mine’s been jam-packed (but in a good way). More on the details of all these new-found pursuits in a little while.Suffice to say for now: some new work-related training and also outside work pursuits have been added to my schedule. Part of which will now include a room full of beautiful yarns to ponder! Have I piqued your interest? Stay tuned…. In the meantime, I’m looking forward to a couple of “chill days” this weekend; catching up on some crafty stuff including getting my “sewing for the summer” plans firmed up. I am also stash-busting in the fabric department and hope to have one day a week designated as Crafts Only: sewing, knitting, crocheting, jewellery-making etc,etc. NO computer, no real work, no unnecessary chores. If I could conjure up an 8th day for each week, I know I could make this a weekly reality. I’m still gonna try though. Seems that if we don’t plan ahead for fun pursuits, the next thing another week has flown past and the “good stuff” never happened. Any suggestions for “squeezing” out more time from each day, do tell. Giving up sleep is not an option btw. Other than that, I’m a listening!!! Another one of my fav things to do obviously is to cook. And again, I am making a committment to try for one new recipe every week. With the goodness of lentils, rice and lots of veggies with an interesting hint of spices to make this one a bit special and different. If you like “meals in a casserole” to pop in the oven and forget about, as much as I do; I’m guessing you’ll be adding this to your main dish regular file. At least I hope so. Do let me know how you and your family enjoy this one. Easy, colorful and delicious. A complete supper from the oven. Thoroughly rinse and drain lentils and also the rice and set aside. Grease a 2 1/2 Qt. casserole or ceramic baking dish and set aside. In a large frypan or wok, heat oil over medium-high heat. Sauté onions, garlic,carrots and celery for 5 minutes until slightly softened. Add drained tomatoes and spices and simmer for 2-3 more minutes.Add reserved tomato juice (add enough water to make 4C. of liquid in total) and vegetable soup cube and stir to thoroughly combine all ingredients. Adjust seasonings, to taste. Transfer to prepared baking dish. Cover and bake for 40-45 minutes until most of the liquid is absorbed. While casserole is baking, combine topping ingredients. Remove cover, sprinkle with topping mix and bake for 10-15 more minutes uncovered, until golden and crunchy on the top. 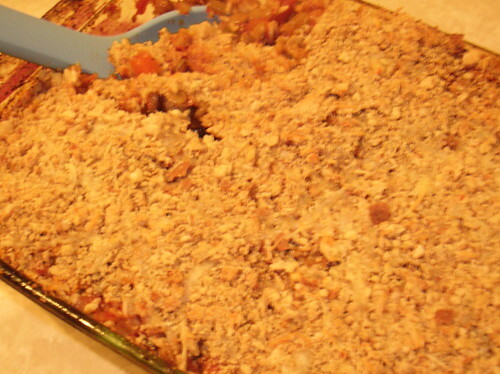 “Green Lentil, Tomato and Veggie Bake” recipe: © 2008 Geraldine Hartman. All rights reserved. I love lentils, and this recipe looks intriguing! I will definitely give it a try! That veggie casserole looks yummy! Re time for crafts, etc., when I worked full time (5 days a week, 8 to 5) I always tried to give myself at least 1/2 hr. a night of craft time. It wasn’t always possible, but on the weekend, I made sure I had one morning or afternoon just for my creative pursuits. Re work, are you going to be working in a yarn store? How cool, if so. I’m going to try it tomorrow. It looks delicious. I’ll let you know how it turns out! Wow, the casserole looks delicious. I wish I could buy a frozen version of that and just pop it in the oven. I don’t do many casseroles as I find I cannot finish them all by myself. However, the next time I need to bring a dish to a group gathering, that could be a good one! Sounds like you’ve got some pretty exciting things going on over there! Hi Merri, I love lentils too. They are such a nutritional powerhouse and so tasty when properly prepared. Do let me know if you give this recipe a try. Hi Selma, Do tell, love to hear feedback. I am just getting back to creating new recipes. It’s going very well. My cookbook Not Just for Vegetarians was published a few years ago, it’s time to get this new one completed. Hi Diana, Welcome back! When are you going to post again, miss ya!!!! I haven’t tried freezing this yet, probably would work out, without the topping put on til later. What about that idea, make a couple one for later. You can do it D! Hi Sallee, Let me know how it goes! Any other cooking from NJFV lately? Have the ‘kids’ used their own cookbook I sent? Hi Sheep, You know, this would be an excellent potluck choice, thanks for the suggestion. LOTS on the go….more details, coming soon. I made this tonight and it was really good! It’s not often that you see a casserole with lentils and brown rice and I get bored with eating them the same old way–in a curry, or plain with ketchup if I’m in a rush. I made a few twists based on preferences (extra garlic and double topping) and what I had in the pantry (panko crumbs instead of regular and pre-made broth instead of water and a broth cube). It was great, thanks G!